Media Molecule had a delivery to make several years ago, and Vita players got the message. The papercrafted platformer was warmly received by fans, and it remains one of the system's must-play titles. Now the company has revisited Tearaway, bringing it to the PlayStation 4. With newly imagined levels and abilities for the console, think of Tearaway Unfolded as less of a recycle-bin raid and more of a love letter to the original release. 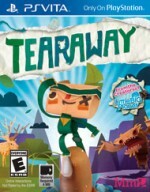 Tearaway stars either Iota or Atoi – tiny little paper creatures whose heads are envelopes containing an important missive especially for the player. Once a hole has been torn between our worlds, you follow the guidance of a pair of helpful narrators to pass along the important parcel. The adventure largely follows in the diminutive footsteps of the Vita version, though the journey has been given a significant overhaul. The most noticeable changes are necessary products of the platform transition; the PlayStation 4 controller's touchpad is functionally similar to the Vita's rear-facing equivalent, but the change in position has rendered one of the original gimmicks obsolete. On Vita, players could tap the pad and see a lifelike finger poke into Tearaway's world, where it would interact with objects and scrap-paper enemies. Rather than clumsily try to replicate that illusion, it's been replaced with something more PS4 appropriate: The controller's LED light bar "beams" a spotlight into the world, which stuns enemies and cleans up errant bits of newspaper. Other elements have been tweaked to put less of an emphasis on the touch controls. For instance, a catapult that flings you into another world is now operated with a gust of touchpad-powered wind rather than a finger-cranked winch, and several clever riffs on the PS4's interface are best left unspoiled. You don’t need to have a PlayStation Camera to enjoy the game, but being able to see your world incorporated into the game is part of the fun. Tearaway is still built on gimmickry, but when it works, it's an absolute delight. My biggest issue with Tearaway Unfolded centers around the platforming. Like Media Molecule’s LittleBigPlanet series, the aesthetic is undeniably cool, but the gameplay surrounding it doesn't always measure up. Tearaway's heroes don’t suffer from the same bizarre floatiness that Sackboy does, but their tiny legs can't seem to keep up with the level designers' most inspired ideas. The last hour or so is incredible to look at, as it deconstructs and remixes themes and ideas that the game has been toying with for hours. Unfortunately, those moments lose their power when your character is inexplicably unglued from a sticky wall, or when the camera angle fills the screen with a close-up shot of paper while you’re in mid-leap. It's a drag, and those frustrating moments come close to burning some of the good will that Tearaway builds up. Fortunately, the checkpoints are adequately generous to make even the most tedious sections at least tolerable. Creation and discovery are at Tearaway's foundation, and I was still pleasantly surprised at the steady drip of new abilities, gameplay elements, and other novelties delivered throughout. Not everything lands, but the parts that do are outstanding. One thing did seem to get lost in the move to PS4, though: Tearaway on Vita was an intimate experience. Holding the device close to my face, it felt as though I was privy to a secret directly from Media Molecule. I’m glad to see the adventure on the big screen, but the console experience feels less personal, and the journey loses a little bit in the transition. That said, Tearaway Unfolded is still a great game for families or anyone else who’s looking for an uplifting change of pace. Early in the game, a helpful squirrel suggests that you check out the companion app. Most of us all have access to smartphones or a tablet by now, and I'll second the critter's thoughts. Connecting to the PlayStation App's second-screen function lets you do several things to make the game a bit more fun. A second player (or you, if you're a multitasker) can create little cutout shapes, which are then blown into the game's world for a moment. Your device's camera can be used to paste selfies, patterns from your drapes, or whatever strikes your fancy into the game, where the images are used as temporary textures. The main event is the app's creation tools. My first attempts at helping Tearaway's residents were kind of a flop. Sure, the king of the squirrels took my lopsided crown and said it was great, but I could tell he was just humoring me. The PS4's touchpad may be the biggest button in the business, but it's as nuanced an art tool as the signature pad at a supermarket checkout lane. Using my phone, however, I was able to create with greater precision, and fling my masterpieces into the game in an instant. The process is nothing short of magical. With newly imagined levels and abilities for the console, think of Tearaway Unfolded as less of a recycle-bin raid and more of a love letter to the original release.